CLEVELAND (JTA) — Joan Rosenthal can’t make pierogies fast enough for the Republicans who have descended on Cleveland. It’s an odd spot for a Jewish woman who started out in the restaurant business at age 12 at the city’s best-known Jewish deli, but she embraces it. “This is so much fun!” Rosenthal, 58, told me on Wednesday afternoon, as she surveyed “Freedom Square,” the makeshift booze and nosh area just outside the Quicken Loans arena. The eastern European dumplings are a Cleveland delicacy, and her staff say they clear a platter – 50 pierogies stuffed with potato and cheese – every five minutes in the two hours before the convention begins each evening. Moving not as fast are tacos and shrimp and grits, both prepared in anticipation of large delegations from the southern and border states. Republicans – like a lot of other folks – like to sample local, it turns out. Also moving in volume: Drink. Marigold, the company Rosenthal founded 19 years ago with her mom, Judy, purchased 50,000 cans of beer, 12 thousand bottles of wine, 1,440 bottles of hard liquor, before the convention, and they expect to sell out by Thursday night. Rosenthal founded the company in her kitchen. Her mother, now 84, still checks in multiple times a day. From a staff of 3, she’s grown to 80, and has called in another 200 or so through an association that caterers maintain nationwide to help out colleagues when, say, tens of thousands of Republican Party officials and lay members descend on your town. She got her start in the business because when she was 12, she was tennis partner to Lenny Kaden, a founder, with Corky Kurland, of the city’s signature Jewish deli, Corky and Lenny’s. He liked the fact that she kept beating him on the court, so he hired her to bus tables. 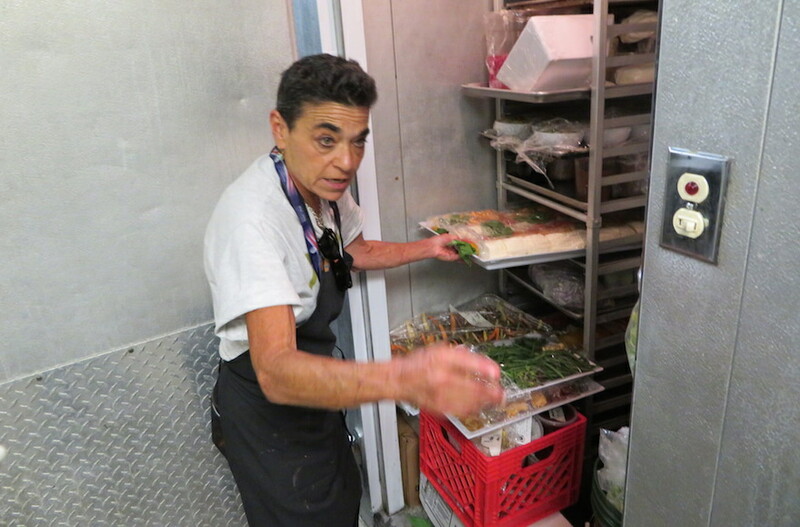 She is steeped in the city’s Jewish culture – she runs the kitchen at Park Synagogue, in the city’s suburbs, and her mother was for much of her career a nurse employed at Menorah Park. She does kosher and kosher style, but nothing says Cleveland, a town packed with Ukrainians and Poles, like pierogies. “Pierogies are our signature,” she said. And now, tiny and wired, scooting among her employees inside the cramped onsite kitchen and patting their shoulders, she is happy to represent.